We promise to rescue you from the side of the road as quickly as we can so that you can get back on your way, but so often our customers get held up at mechanic shops waiting for their vehicles to be repaired. That’s why we also offer auto repair to get you back on the road even faster! For semi truck breakdowns or accidents that happen around Burley’s highways, we also have qualified personnel and the right equipment to quickly clean up the scene. Our heavy wrecker towing service responds to semi collision and rollover accidents quickly to ensure the road is cleared for other drivers and that the damage is removed with safety and care. Our team is highly familiar with the formal processes and paperwork which surround semi accidents and their tow jobs. 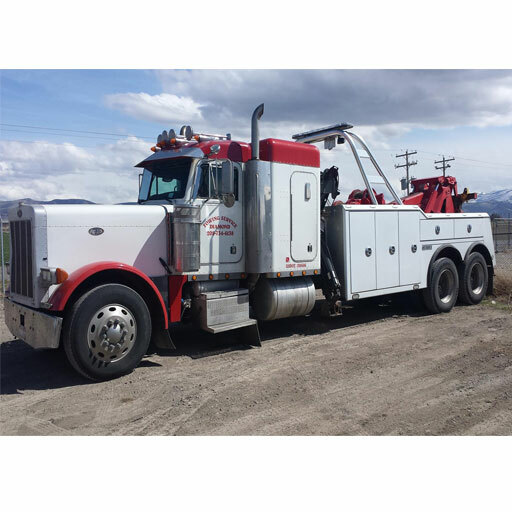 We also regularly work with semi trucking insurance companies, which gives us the competitive edge over any other towing service in the area. We have been working with AAA for many years now and are committed to ensure our AAA customers receive quick and reliable service. Don’t want to call AAA and then have to wait to have them call us? No Problem! You can call us directly to ensure that you receive the quickest service possible so that you can continue on your way! Our divers are Wreck Master certified so they know the best way to take care of your vehicle. Each driver has under gone additional training on the job to ensure that you will receive the highest quality and quickest service possible. You can get to know the driver that will be assisting you on our “Our Team” page. No other Burley Towing Company Can Match Our Service! We having been in the towing industry for over 15 years. That’s why we are so confident in the service that we offer to our customers. We have had years of training and practice to ensure that you are receiving the top rate service you should expect from a Towing Company. Don’t Wait on the Side of the Road. Call Us Today! There is no reason to wait. Give us a call and we will get to you as quickly as possible! We guarantee that you will be satisfied with the service you will receive! (208) 878-4357 If for any reason you are not satisfied with the service you receive Please give us a call so that we may better serve you in the future. We are located at 105 S 450 E Burley, ID 83318, which is just off Hwy 81 or “The Declo Hwy”. If you are heading East on I-84, You will want to take Exit 211 by Love’s and turn left on to U.S. Hwy 30. Continue on Hwy 30 for 2.4 Miles, then left onto ID 81 E. Continue on ID 81 E for 3.8 miles, then turn right on S 450 E and it is the first building on the right. The Towing Companies of Southern Idaho, located in the Burley and Twin Falls Idaho Areas, are pleased to offer the Towing Companies of Southern Idaho Entrepreneurship Scholarship. The Scholarship is open nationwide to those who will be attending college spring semester of 2017. Special consideration will be given to an undergraduate who is interested in pursuing a career in Business, but anyone meeting the requirements will be considered. This Award will be presented to a current college student or a graduating High School Senior. This will be a one-time award. This scholarship is judged & awarded primarily on merit & need. Completed application must be submitted online by December 31, 2016. LATE APPLICATIONS WILL NOT BE CONSIDERED. Applicant must plan to attend college by Spring semester 2016 if a current college student, or Fall semester 2017 for a graduating senior. This scholarship is a one-time award worth $500 to be awarded the Spring semester of 2017 or the Fall semester of 2017. 500 word essay answering this question: What are the merits of the free enterprise system? Please do not call about this scholarship. Contact us at snakerivertowingcommunity@gmail.com for any questions. Thank you! Please include your 500 word essay responding to the question - What are the Merits of Free Enterprise?